The Rehabilitation Building offers newly renovated classroom space with state of the art technology in both classrooms and labs. Our facilities include large lecture theatres and classrooms, a mobility lab, an activity of daily living lab, several seminar rooms for small group work and an assistive technology computer lab. All facilities are available to students 24 hours a day, seven days a week for study purposes. Located at the centre of the Bannatyne campus is the recently renovated state of the art Health Sciences Library which houses extensive collections and services that support learning, teaching, and research. Also of great pride is the new teaching and learning simulation facility and the many research and education Centers of Excellence such as the Manitoba Center for Health Policy and the Center for Aboriginal Health Education. 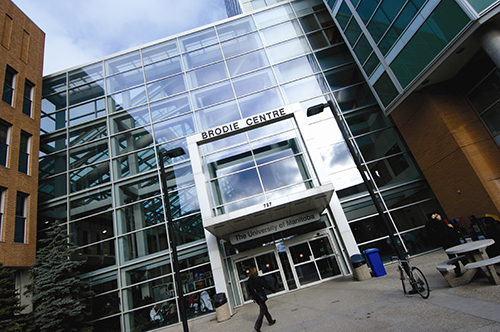 Other frequently sought out resources on our campus include the Joe Doupe Recreational facility, and the Brodie Centre food court. Specialized research facilities, equipped to meet the needs of various programs, are conveniently housed in two locations: the Bannatyne Campus and the Rehabilitation Hospital of the Health Sciences Centre. Some of the specialized research labs include Aging, Social Cognition and Rehabilitation Research Lab, Occupational Performance Research Lab, Applied Exercise Physiology Lab, and Human Clinical Pain Research Lab.